Dubai, UAE, April 02, 2019: REXSOL is undoubtedly the ultimate luxury in skin and hair care. For nearly three decades, the brand has been employing the latest technology and innovative methods to deliver superior beauty products for both men and women. REXSOL's unparalleled commitment to excellence, luxury and innovation has seen its popularity increase grow over the years, and its products are the most advanced, safest, and highly effective in ensuring optimum results. REXSOL has a comprehensive line of advanced, high quality skin and hair care products that's now being sold in over 40 countries worldwide. The results are immediate, the improvement dramatic, and formulas so exquisite that they are truly considered one of the most superb skincare and haircare treatment in the world. REXSOL is available at leading pharmacies in the UAE. REXSOL is science of skincare and haircare. The brand is recognized internationally as one of the leaders in the research and development of high quality effective skin and hair care. The REXSOL collection provides you with the ultimate face beauty treatment, acne treatment, breast and body beauty treatment, sun care protection, and hair treatment. Its product categories include Cleansers, Whitening creams, Acne Treatment, Body Care, Retinol Anti-aging, Vitamin C Anti-aging, AHA Anti-aging, Moisturizers, and Eye Care. REXSOL uses plant-based ingredients and does not test on animals. Each product is submitted to various tests before, during and after production for purity, stability as well as efficiency tests to prove the long-lasting effects. All products are manufactured in the state-of-the-art laboratories in Southern California, USA. Here are a few essential picks from the REXSOL range. REXSOL's Vitamin C Serums helps soften existing fine lines and wrinkles—while preventing new ones from forming. It improves skin texture and refines facial contours. It effectively minimizes the appearance of fine line while enhancing skin's youthful appearance within a week. For all skin types, it is available in C-10 (AED 189 for 30ml, AED 230 for 50ml), C-15(AED 220 for 30ml and AED 230 for 50ml) and C-20(AED 230 for 30ml) – with each serum variation featuring a higher percentage of stabilized L-Ascorbic Acid. REXSOL’s Vitamin C face cleanser is a rich foaming gel, formulated with Vitamin C to gently remove makeup, dirt and surface oils, leaving the skin clean, soft and moist. Perfect for all skin times, it promotes moisture balance, freshness and comfort. Collagen is a structural protein that holds cells together, strengthens skin, and gives it elasticity. REXSOL's Collagen Serum boosts skin's natural ability to produce new collagen and elastin. It minimizes the visible appearance of fines and wrinkles while reducing scars on the skin by supplementing the collagen under the skin and the renewal of cells. 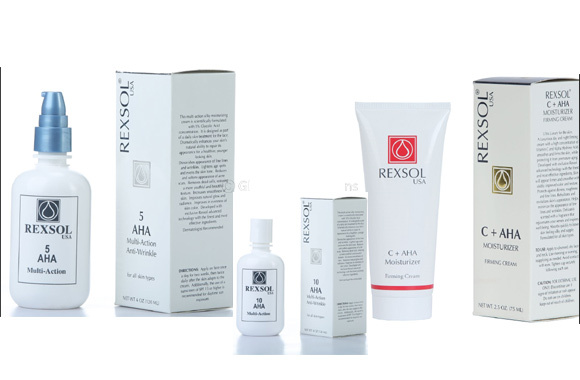 Other products available in the REXSOL range include Retinol, AHA and Caviar skin treatments, hair & scalp care and body-care treatments that help to maintain the appearance of youthful firmness and shape of body and breast. REXSOL is available at leading pharmacies in the UAE including BinSina, SuperCare, United Pharmacy, Community Health Pharmacy and Health First Pharmacy.